Bread pudding is a classic dessert for the winter season. It’s warm, comforting, and most of all delicious. Using panetonne which is a cakey bread filled with raisins and candied orange zest, and the warming spices of cinnamon and nutmeg really make this a perfect dessert for Christmas. Lightly butter a 13 by 9 inch baking dish. Arrange the bread cubes in the baking dish. In a large bowl, whisk the eggs, cream, egg nog, sugar, vanilla, almond extract, orange zest, cinnamon, and nutmeg. Pour the custard over the bread cubes, and press the bread cubes gently to submerge. Let stand for 30 minutes, occasionally pressing the bread cubes into the custard mixture. 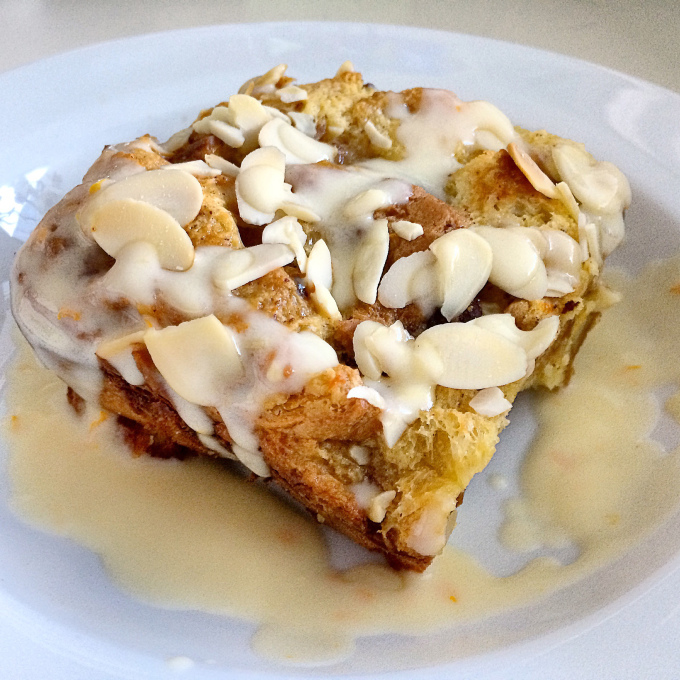 When you’re ready to bake, sprinkle the sliced almonds all over the bread pudding. Bake until the bread pudding puffs and is set in the centre, about 60 minutes. Let cool for 10 minutes. Spoon the bread pudding into bowls, and drizzle over the egg nog rum sauce. To make the sauce: Bring the cream, egg nog, and the rest of the orange zest, and juice to a boil in a small saucepan over medium heat, stirring frequently. In a small bowl, mix the spiced rum and cornstarch to blend and then whisk into the cream mixture. Simmer over medium-low heat until the sauce thickens, stirring constantly, about 2 minutes. Set aside and keep warm. You can prepare the bread pudding and have it sit in the refrigerator covered in plastic wrap for up to two hours. Then take it out of the fridge when you preheat the oven and bake. I like to use the panettone that has raisins and candied orange peel. They come in many different flavours but I like this one the best. If you’re not really into the sauce, a scoop of vanilla ice cream always works. The sauce can be refrigerated and reheated on a stove top. This dish can also be eaten at room temperature, and is really good for breakfast the next morning.